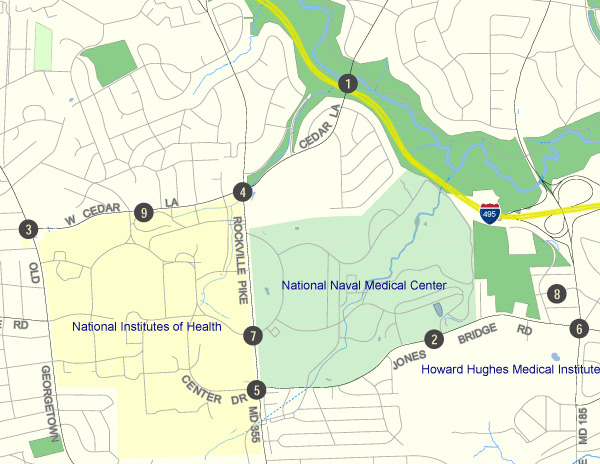 The Base Realignment and Closure Act (BRAC) resulted in federal plans to expand the National Naval Medical Center in Bethesda. The expansion will consolidate services from the closure of Walter Reed Army Medical Center in Washington, D.C. The consolidation is expected to be complete by September 2011. The Maryland State Highway Administration (SHA) the Montgomery County Department of Transportation (MCDOT) are developing plans for nine transportation-related improvements for the area to mitigate the impact of the medical center expansion. Those plans will be reviewed by the Planning Board as mandatory referrals, which provide the Board an opportunity to make recommendations on federal, state and local public projects such as roads, schools and libraries. Those recommendations, developed with support from its professional planning staff, are transmitted to the appropriate government agency for consideration. Learn more about the BRAC transportation projects by watching this clip from Montgomery Plans featuring planner Larry Cole. Locate the nine transportation projects and click on a number to learn more about each project. July 22, 2010: The Planning Board reviewed and forwarded comments on BRAC projects #3-#6 as mandatory referrals. June 10, 2010: The Planning Board reviewed and forwarded comments on the Cedar Lane Bridge (#1) to the county Department of Transportation.